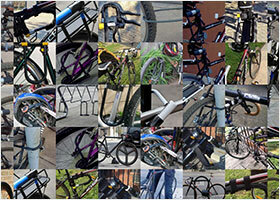 But the most commonly stolen bike parts are definitely wheels and seats. One reason for this is that many bikes are now fitted with “quick release” skewers. These are clamps that allow you to easily remove your wheels or seat without using tools. 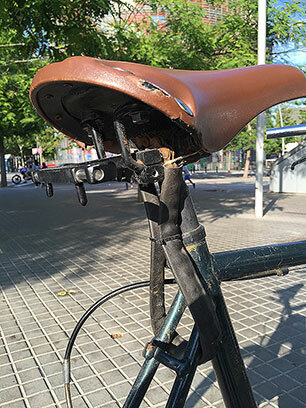 Because if your bike has quick release clamps, unless you use some additional security, anyone passing your bike can simply push open the clamps and walk off with your wheels or seat. No tools needed. The problem with this method is that these cables can be snipped through with the most basic wire cutters in a matter of seconds. And since all bike thieves carry wire cutters, if your wheel or seat is not stolen while secured like this, it’s only because the thief can’t be bothered! Surely there’s a better option? Well, you could simply replace the quick release skewers with bolt on skewers. Whereas quick release levers can be tightened and loosened by hand, with bolt on skewers you usually need a Hex (Allen) key. Both Nashbar and Halo make good quality, inexpensive bolt on wheel skewers which are easy to fit yourself. And for the seat you can either replace the whole seat post clamp or get a normal bolt for the existing collar. Of course they won’t stop a thief with a Hex key! But in my experience, they are a deterrent on low value bikes. And they’re relatively cheap. But if your wheels and seat are even vaguely attractive, or you live in a high theft area, you’re going to have to do much more than this. I’m sure there’s loads of things in life more annoying that having your bike seat stolen. But when it happens to me, I’m hard pressed to think of any. I’m not sure if it’s the public humiliation of riding a seat-less bike back home, the physical exertion of a journey without being able to sit down, or the pettiness of the theft itself. Whichever it is, it’s enough to make a peaceful person harbor violent thoughts. But what can we do to prevent it? The most extreme solution is to remove your seat post and take it with you every time you leave your bike. This will certainly stop anyone stealing it. But what a pain. And for me this option stinks of defeat. It’s an admission that the thieves have won. We are reduced to carrying around a grubby, cumbersome piece of metal everywhere we go. This is not why I ride a bike. There has to be a better option. Surely? You could thread a cable lock through the seat rails and then around the space between the seat stay and the seat tube. This fastens the seat to the bike frame. But cable locks can be cut through very, very easily. Using an old bike chain rather than a cable lock provides a bit more security as a chain is more difficult to cut. This is an increasingly popular option. However, it does attach your seat to the bike frame more permanently, so make sure you’re happy with your seat height first. buy a special secure skewer for your clamp. So you’ve replaced the quick release lever with a standard Hex screw clamp. But a thief with a Hex key can still steal your seat very easily. You can make a standard clamp difficult to unscrew by filling the socket with something that prevents a tool being used to loosen it. Whatever you use, should be difficult to remove. But the thing to remember is that the more difficult it is for a thief to remove, the more difficult it will also be for you should you want to make some adjustments! Should you later need to remove the ball bearing to make some adjustments, you can use acetone or Z-7 Debonder to dissolve the glue. Other materials you could use to fill the socket include steel epoxy, solder, Sugru or candle wax. Each one provides a different level of security depending on how difficult it is for a thief to remove. Don’t forget, the more secure it is, the more difficult and frustrating it will be when you need to remove it! But in fact, this technique is very effective and can be used to secure any of your bike components. If this method is too much hassle, then there is a more elegant (although more expensive!) alternative. Hexlox work in exactly the same way by filling the hex socket with an obstacle that prevents an Allen key from inserted to loosen the clamp. However, in this case the obstacle is a small metal nut that’s held in place by a magnet. According to the manufacturers it can’t be removed by a stronger magnet (since it’s protected from above by a non-magnetic steel shield), by tweezers, gator grips, screw drivers and several other tools and methods that hadn’t even occurred to me! The only way to remove it is with the specific key that comes with your Hexlox. What I really like is that it doesn’t require you to change your existing set up, it’s quick and easy to install and it’s relatively cheap! Read my full, hands on review of the Hexlox here. If you don’t fancy these DIY options, you can also buy specially designed, secure seat skewers. These can work in a number of ways. Some of them use non-standard socket shapes and keys. Others use gravity to lock the levers when the bike is in an upright position (as it always should be when it’s locked up). However ultimately, if a thief really really wants your seat, he can saw through the seat post. So if you’ve got a nice seat, maybe the best option is to take it with you? As I talk about further in the how to lock your bike page, ideally your locking strategy should include two locks. One secures the back wheel and the frame to the bike rack. The other secures either the front wheel and the frame to the bike rack or just the front wheel to the frame. Or, if you’ve only got one lock and have quick release wheels, you could remove the front wheel and lock it together with the back wheel and the frame. However, neither of these methods is ideal. Decent bike locks are heavy and cumbersome, so carrying two locks around can be a pain. As is removing your front wheel every time you leave your bike somewhere. Surely there must be a more convenient way to protect our wheels? Well, yes there are. Depending on what type of wheels you have, they’re called either “locking skewers” or “solid axle locks”. But which one do you need? 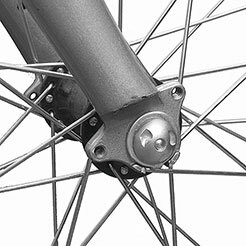 If your bike has quick release wheels like in the the photo below on the left, then you have “hollow axle wheels” and would replace the existing skewers with “locking skewers”. If your bike has nutted wheels like in the photo below on the right, then you have “solid axle wheels” and would replace the regular nuts with “solid axle locks”. These locks are available for both wheels and seat posts and use various ingenious methods to stop unwanted hands from unscrewing them. They’re certainly more convenient than carrying two U-locks around or removing your front wheel every time you want to lock your bike. These work just like normal hex skewers or nuts. Except that in each set, the heads are a “unique” shape. And you use a special “unique” key to tighten and loosen them. Because they’re unique you can only use your specific key to unlock your specific nuts. In actual fact, they’re not strictly unique. But there’s a huge number of different key combinations, so the chances that anyone else will be able to unlock your skewers are very, very small. Of course, when you want to remove your wheels or seat you need to have your special key handy. However, to me this seems a small inconvenience. And at the moment these are the most secure type of wheel and seat locks available. However, there are just two companies offering locking skewers and solid ankle locks with “unique” keys: Pinhead and Pitlock. And you can even register your key online so you don’t have to remember the code. They are available for wheels, seats, and even headsets. And they produce versions for both quick release wheels and solid axle wheels. Do they work? Well generally yes. It is possible to unscrew the heads without the special key, but it takes a fair bit of time and effort. And most thieves will not have the tools. There are also some reports of them coming loose over time. So you should always carry your key with you to tighten them up. But I’d imagine you would always want to have the key handy anyway, in case you have a puncture. Overall, I think the Pinhead skewers are great. They will never be as secure as a second lock. But they’re far more convenient. And they’re far more secure than any cable lock. I would certainly trust them on shortish trips. But I might be wary about leaving a bike for a long period of time in a high theft area with only Pinheads protecting my wheels. Unlike the Pinhead key, the keys that come with the Pitlock have no lever, so in order to use them you will need to use a 10 mm spanner or insert another tool such as an Allen key into the hole to get enough leverage to screw and unscrew the nut. Pitlocks have a slightly better build quality than Pinheads and are a bit more secure. However, they are also more expensive and not quite as easy to use. But if you’re looking for the ultimate protection, they are probably the safest locking skewers available today. While they don’t quite match the “uniqueness” of Pinhead or Pitlock, there are more than 40 different key combinations for the security skewers (and seat clamps) from IXOW. The key is a small cylinder with a recess that fits a hex key at one end and a series of protruding spikes at the other. These spikes fit into a matching series of holes on the heads of the skewers or clamps. So if you stick a hex key in one end and the spikes in the holes, you’re able to tighten or loosen your skewers and clamps. Easy! Each set features a slightly different distribution of spikes and holes which makes this solution more secure than the simpler non-standard key option. And you get a service card which enables you to register your specific key so that you can order a new one should you lose the first. While they won’t be as secure as Pinheads, these skewers are certainly likely to deter the casual thieves which make up the vast majority of seat and wheel robbers! These work just like the previous locks. Except that they all have the same, albeit non-standard shaped heads and keys. This means someone with a standard tool set shouldn’t be able to unscrew them. However, since all the keys are the same, anyone who owns the same brand as you, will be able to unscrew them. All this means they’re obviously much less secure. And while they’re also much cheaper, I’m not sure that they provide much more protection than standard Hex skewers or nuts. And don’t forget, you only get the one key, which you’ll need to keep with you and if you loose it, it’s usually impossible to get a replacement (without buying another set!). In the US, the Delta Hublox Security Skewers are perhaps the best of these non standard skewers. While in the UK, ETC and Trans-X are reasonable quality, although there are some reports that they can be unscrewed with pliers from the other end! But I think that if you’re concerned enough about your wheel and seat security to consider upgrading your standard skewers or nuts maybe it’s worth spending the extra money on one of the other methods. While your bike’s upright they’re locked and cant be unscrewed. In order to remove them, you need to turn your bike over. At this point, the gravity based mechanism is released and you’re able to unscrew the component. How is this secure? Well, if your bike is locked up properly, it should be very difficult to turn it over into a position where the mechanism is released and the component can be removed! As far as I can tell, the OnGuard skewers are actually re-branded Zefal skewers, so I’ll deal with them at the same time. Zefal skewers look just like normal quick release skewers. But once closed, the lever can’t be re-opened unless the bike is turned upside down. And if a bike is properly secured to an immovable object, any prospective thief won’t be able to turn it upside down. For starters, they can sometimes be opened by a trick with a magnet which you can find by digging around the internet. But much more significantly, while the lever side may be secure, the nut on the other side of the skewer can easily be twisted off with a pair of pliers! The other problem is that because they look like normal quick release skewers, thieves are more likely to try to force them open. This could damage your bike or even the skewers themselves to the extent that they’ll no longer open at all. The Kryptonite locks work on the same principle as the Zefal skewers. That is, the bike has to be turned completely upside down to release them. However, the similarities end there. The Kryptonite locks are available for both solid axle wheels (as WheelNutz) and hollow axle wheels (as WheelBoltz). They are fitted and removed either with a 15 mm wrench (WheelNutz) or a 5 mm hex wrench (WheelBoltz), so they don’t look anything like quick release skewers. And most importantly they can neither be defeated with the magnet trick, nor twisted off from the other side with a pair of pliers! They’re much more secure than that. So the Kryptonite wheel locks are definitely a step up from the Zefal offering. But of course they’re more expensive too. The Abus locks are similar to the Kryptonite gravity locks in that they’re available for both solid and hollow axle wheels. However there are important differences too. Unlike Kryptonite, Abus offer seat locks as well as wheel locks. And they’re available in a range of snazzy colors. You use a 5 mm spanner to fit both the solid and hollow axle models. But most significantly, to release the gravity mechanism, you turn the bike on it’s side rather than upside down. To me this seems a little less secure and it’s definitely not as practical when you’re trying to change a tire. However, they’re so easy to fit and work so well, I think they’re a great choice if you’re looking to replace a secondary cable lock. Read my full, hands on review of the Abus NutFix wheel locking skewers. As well as the “unique” keyed solutions, IXOW also provide gravity protected skewers and nuts. Plus a seat clamp! They work in the same way as the Kryptonite solution in that they’re tightened and loosened with a hex key and the bike must be completely upside down to release them. As long as you remember to lock your bike so it can’t be turned upside down, then I find this method works really well and you’re very unlikely to suffer a theft. Read my full, hands on review of the IXOW wheel skewers here. The most secure of these are those with “unique” keys such as Pitlock or Pinhead. The ones that use gravity from Abus and Kryptonite are probably the next most secure. And least secure (although still far better than quick release) are the ones with non-standard keys such as those from Hublox, ETC and Trans-X. Seat security is a little more complicated. You can of course buy the same secure skewers and nuts that you can get for wheels. Or you can try one of the DIY options such as fastening an old bike chain through the seat and frame or super gluing ball bearings in the screw heads. Ultimately though, if thief really wants your seat, he can saw through the seat post relatively easily, so I wouldn’t leave a £100 Brooks saddle alone for long, whichever method you employ! To sum up, I think secure skewers and nuts can provide adequate security for most people in the majority of situations. And they’re so much more convenient than a second lock. But when you really, really want to be safe, use two locks! Thanks! I’ll have a look at these and hopefully add them to the next update! Where is the ‘next update’?? Is there a late 2018 edit of this article? I do update it as new locks are released. I’ll be doing a full re-write though in early 2019. Thanks Aristides, that looks like a useful option. Don’t bother much with atomic22, you can get gold cheaper than their parts! Great site by the way! Some of the systems are missing however… For exp. : http://www.sphyke.com or http://quick-caps.com/quick-cap-single-black I am ordering two of the last because the cheapest (but still expensive) system! Kryptonite also makes gravity locks. And BTW, it’s Zefal, not Zefel. Corrected. Thanks! I didn’t realize Kryptonite made gravity locks as well. I’ll add them in the next update. i only skimmed the article but you should point out that almost all unique pin and funny shaped key systems are defeated by the same tool. This also includes almost every method of wacky keyed sockets and oddly shaped wheel nuts “locking” nice rims to cars. I guess gluing a wrench or allen key to the security lock could work. I think he’s talking about the Gator Grip I mention in relation to the Pinhead locks. For those locks at least, the Gator Grip doesn’t work anymore (as far as I’m aware). No, i’m talking about those nut/socket sets that are made to turn random shapes and stripped objects. picture a socket that’s just a nut on the outside for you to turn, but the inside cutout is a conical shape with spiraling bladed cutter pattern. The sets come with inside cones of varying depth, angle, teeth/cutter patterns to fit over almost anything. if you put these on a lathe and shoved a metal rod into it, they would chew it down the length like a pencil sharpener. These will grab a perfectly smooth dome (gatorgrip will not) ..no special and unique key notching. Of course, finding the right size you can remove any type of lugnut. Basically, all you need is the socket tool right size inside cone to fit onto the object you want to turn. The only things they might not work on is something made out of a metal as hard as the cutters so they can’t dig in. but they’ll still work if the object is even a little out of round. Ahh I didn’t realize this. Good to know, thanks! For car rims held on with big long security head nuts that aren’t recessed, you can use a common pipe wrench also. I just had to ride my fairly new bike home with no seat! Fortunately, I had the seat from my old bike I could put on but I need to replace the quick release lever as soon as possible. I don’t want to spend a fortune but I need a clamp that requires a tool at least to loosen. I tend to think the seat was stolen by some idiot kids just for kicks. Yep, just replacing the quick release lever with a hex bolt normally does the job. If you leave your bike for long periods of time, or even overnight, you might want to think about additional security. The old bike chain method works well for me. Or you could just fill the hex head with hard drying putty. 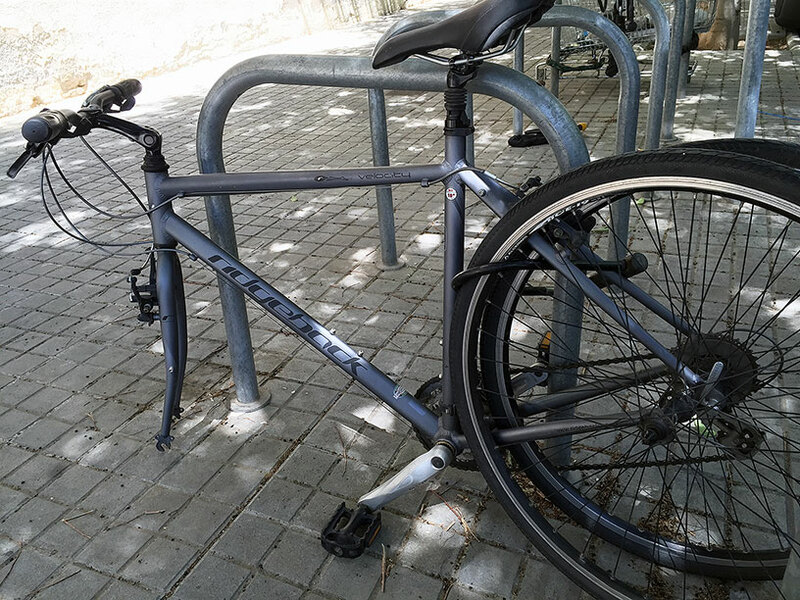 If you have a locked front wheel, then can you safely just U-lock the front wheel to a bike stand? I’m not sure what you mean. Yes, you can safely U-lock the front wheel to a bike stand as long as the frame is locked to the bike stand elsewhere. But I’m not sure what you mean by “if you have a locked front wheel”. If the wheels have locked skewers, so they can’t be removed from the frame, then can’t you just lock the front wheel to the bike stand using a strong smaller lock system, rather than a longer heavy chain and lock system looping through both wheels and the frame. 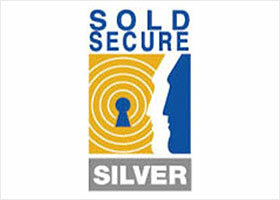 Might this reach Silver or Gold security standards? Ahh sorry I understand. Yes for sure, locking the wheel to the bike rack with a U-lock is just as secure as using a longer heavier chain that loops through both wheels and the frame. And that’s regardless of whether you have locked skewers or not. As long as you use a strong lock on the frame as well. its becoming more important to lock your wheels. every week i see several people on bikes carrying a bike wheel around in the middle of the night. …the welfare street people type who dig through the recycle bins for cans and bottles. last night i saw 2 of them riding together at 3am, 1 carrying a front wheel, 1 with a back wheel. they obviously found a bike locked by the frame only. I would guess i saw 4 wheels in total being biked around just this week. I don’t know how many times i’ve seen one of them with a wheel bungee corded to the handle bars during the day where that wheel alone was worth many times the whole bike they were riding.. Many of the new commute/gravel bikes come with thru axles. Who makes locking thru axles for these wheels? I think Pinhead have some on the way. For anyone still looking: Pitlock has some. Excellent source of bike security knowledge. 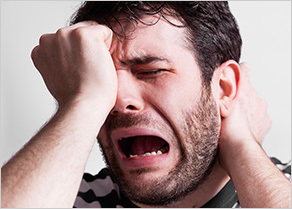 I have just spent half a night browsing all these different products guided by your website. It would be nice to have it updated with the products listed in the comments, some of them are quite interesting. I found my favourite here for locking the bike itself (Abus Bordo) but as for the wheels and seats the choice was more complicated, there was always something wrong with the solution. For example, widely reported poor quality and security of Zefal, the requirement of placing the bike on its side in Abus NutFix which otherwise seemed a brilliant candidate, there were reports of issues with Kryptonite WheelBoltz too. In the end the best and most elegant solution for the seats, wheels and other components appears to be one offered by https://hexlox.com (not described here) – a lockable alternative to ball bearing trick where you just need one unique key and standard allen keys. Would you mind giving it a closer look? Quick Caps seem a clever idea too (retrofitting over *some* types of quick release skewers) but not as inconspicuous as HexLox. Possibly useful when needed temporarily, e.g. in transport or on bikes that are only occasionally left outdoors alone (like mine). Thanks for the heads up Johnny! The Hexlox look really interesting. I’ve added them to the main article. I tried the Krytonite Wheelnutz on my Surly Crosscheck. Thought this was going to be it. I was wrong. I could not get them to hold my HED wheels on my Surly. Wheelnutz maybe work well as locks but not as axles. Tried riding with them on, it was bad. Every couple stops I’d have to get off my bike, turn it upside down, readjust the axle, tighten, upright, ride on. Half mile later, repeat. I originally got some sympathy from the Kryptonite customer service. In the end they did nothing to satisfy me on this. I would be really leery about purchasing Kryptonite Wheelnutz, $50 and nothing. Oh no! That’s disappointing Kurt. I’d been looking forward to trying them out as well. The problem with seatpost locks is that the thief can still steal the saddle by undoing one of the bolts used to adjust it. That’s what happened to my bike, so when I replaced the saddle, I used vinyl spray paint and a stencil with my name on sides. Nobody is going to steal it because it’s worth exactly $0 now (unless some guy named Jim Chu want a personalized seat). If you decide to try this, use the type of paint compatible with your seat material. Test it by putting a small dot on the seat material underneath the seat. Make sure it’s the kind of paint that bonds to the original material so it can’t be scrubbed off, and more important, that it doesn’t melt the material. And be certain you have no intention of ever selling that saddle – because you can’t! That’s why nobody is going to steal it now. You can do the same thing to rims with an electric engraver (as long as they’re not chrome plated steel). Just deface it enough where it has no resale value. And if you want to make allen head bolts that leave thieves scratching their heads, fill the cavity with hot melt glue and then press aluminum foil (or whatever thin material that matches your bolt) over the top to flatten it out. Trim the edges with a razor knife. If the bolts are not silver, use epoxy paint to match the color. Now only you know it’s just glue that can be popped out with a wood screw. And you don’t have to do all the bolts – just enough to secure the item. Fantastic tips Jim! Thanks a lot! Have you checked out Hexlox though? I think they supply “lockable” alternatives to the bolts used to adjust the saddle. I’m currently testing them out so and will post a full review in a short while. Carl, hexlox sounds good. but I can see them being defeated with superglue and a Q-tip. But you’d need a cone wrench to do that wouldn’t you? Yes. But it does seem to be an exploit. For sure. As always it’s all about balance though. What’s the chances of a bike thief carrying around a cone wrench. Slim I’d say, unless he’s particularly targeting a specific wheels because the wheels are highly desirable. If you’ve got particularly desirable wheels and you’re in a high theft area where the thieves will target bikes with cone wrenches then you’d presumably use the 2 lock system rather than security skewers. For most people this won’t be the case though. It’s all about finding the right balance for your circumstances. For example I’ve discovered that in my area I don’t need to protect the solid axle wheels on my crappy beater bike at all. They’re just of no interest to the thieves round here. My seat is another matter entirely though! Have you considered reviewing the IXOW products? They have coded keys and gravity locks for seatposts and wheels. Many thanks for your great website !! – Do you know if this is true ? – Does the other similar gravity solution with hex key, Ixow, have an anti-slipping surface ? I’ve got admit I didn’t have this problem with the Kryptonite Gravity skewers. Maybe because my rear drop outs have lawyers lips. If it’s an issue for you then the Abus Nutfix do have the stippling rough edges, which should reduce slipage. I will try the Kriptonite, and see how it goes. Many thanks again for your website and your dedication ! !